January always seems to go by faster than I expect and my 2014 has started quickly and is going to end in a busy way. I’m preparing to go to ALA Midwinter as I’m now living on the East Coast which means I can visit family while getting to spend time with librarians. Before heading north tomorrow, I wanted to recap some of my favorite events that have happened this month, because there’s been a lot of creativity and reminders of how I am a librarian for me. 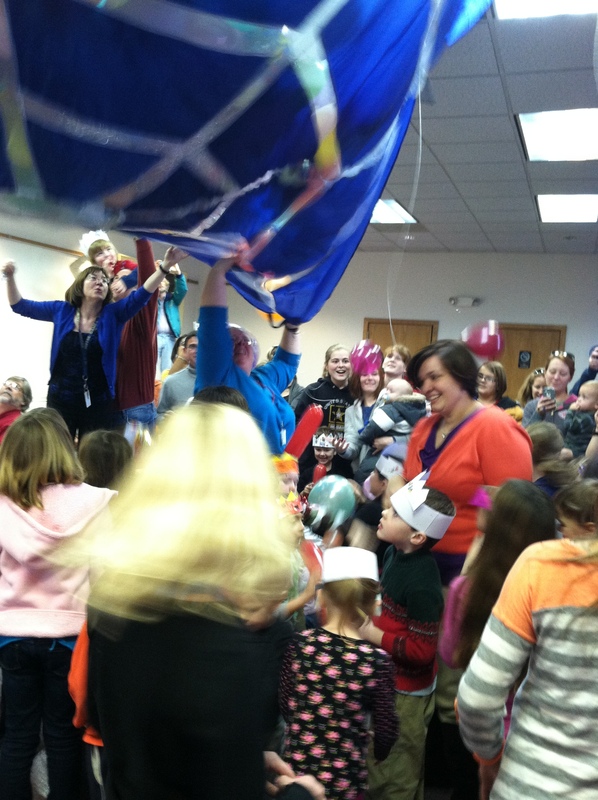 To start off, I helped run a great celebration on New Year’s Day called Noon Year’s Day. This is an event that was inspired by something that happens at the Delaware Art Museum and was the first time it was run at the Lewes Library. The set up is rather simple, throw a party for the kids in the area and instead of celebrating the New Year at midnight, do it at noon. The big part of the set up was attaching a parachute, a small one to ceiling and filling it with balloons that could be dropped when noon hit. Below you can see the wonderful chaos as the balloons dropped when the countdown happened. I found a countdown on timeanddate.com which was projected onto the wall. There were three crafts and food and in the end almost a hundred kids went through, because its been a cold winter and this was a great distraction. I love events like this, that aren’t too hard to pull together, a lot of the craft supplies and set up were based off of what the Children’s Librarian does for Summer Reading. It was simply a matter of altering them for New Year’s. Crowns with 2014 on them, handmade tambourines made out of paper plates and using pipe cleaners to create fake sparklers and string cheerios on to feed the birds plus seats for the adults. Entire families came and enjoyed themselves including making a lot of noise when it was noon. It was one of the best New Year’s parties that I’ve ever been to for the joy going on in it. A few days later, I was able to revisit a favorite place of my childhood and feel rejuvenated by the presence of art. The Coastal Camera Club is something that both my parents are active with and I’ve been attending meetings. Its a wonderful organization that welcomes all levels of photographers and works to help them be creative and thoughtful. A part of that is they organize trips to places to take photos and there was a trip to , now this is a place that I used to go to as a young girl. The gardens were built by some members of the DuPont family with the idea that they would be open to the public, plant research goes on and in the summer performances. The day we went it was bitter cold so we spent most of our time in the Conservatory, which is a sprawling series of greenhouses containing all types of gardens. Since it was a cold day, there were few other people there and I was able to walk around following my eye. This is how I prefer to look at art and that day, all the plants were art and I found a way to capture some of their beauty with my camera. I’m going to post one of my pictures since a place I’d forgotten is the Children’s Garden that is full of playful fountains and statues that seem to invite you to another world. 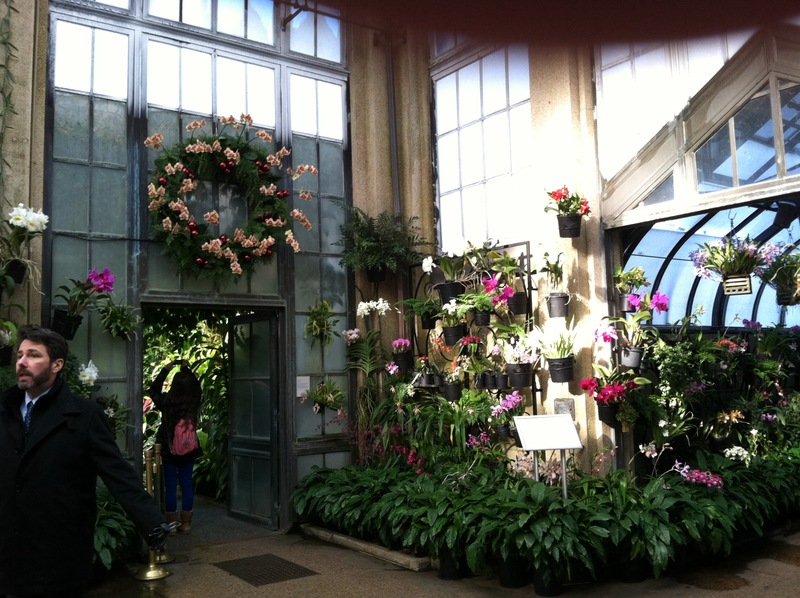 Below is a picture of one of my favorite places in the Conservatory, the Orchid Room where I was lucky enough to be in on my own for a number of minutes. Also this month, I finally had a chance to read Fangirl by Rainbow Rowell and it was a book that surprised me in the best way. My review can be read As someone who has been involved in many types of fandom and roleplaying, various activities that made me on the edges, this book clicked with me. Rowell was able to capture how powerful the internet can be for finding your tribe out in the world and also how writing fanfiction provides another way to connect with favorite authors. I would recommend to anyone who is working with teenagers and college students and isn’t sure what they’re doing on Tumblr or what’s so special about Teen Wolf to read this book. On that note, I need to go and finish getting ready for Midwinter and I hope to meet with one of my groups, the librarians.